All relationships take time, they are hard work and they are not without difficulty. This is just as true with your relationship with Jesus and he doesn't hide the fact that it won't be easy. In his name, he sends you out to come alongside people and to make disciples. When he sends out the seventy two in chapter 10 he doesn't send them with a packed lunch and reassurance that they'll have a nice time. He sends them with the clothes on their backs and as lambs among wolves. To the towns they entered they would look defenceless and non threatening, without weapons or money. They maintained an innocence but they needed to be careful, not everyone would be accepting. With nothing else to rely on they truly knew what it was like to rely on the protection of God, to trust the relationship they had with him. You share it as you show it by being humble, just and merciful Micah 6:8. You extend the relationship Jesus shares with you to others, the parable of the Samaritan instructs us how to live in relationship with others as Jesus would. He took pity on him (10:33), there are times when you may pity many people, as you walk on by, but mercy comes when you act on that feeling. He went to him and took care of him (10:34), taking a step toward another person is an act of kindness and acceptance. He was generous with his time and money (10:35), it would seem the Samaritan needed to get on with his life, maybe go off to work, but he did not just abandon the injured man he made sure he was looked after and promised to return. We live busy lives, it can be tempting to ignore acting on the pity you feel for someone because you know it will take time and effort and you're already stretched. It can be detrimental to someone to take a step toward them and then abandon them because you're too busy. If you take the step trust that God will give you the time and resources to fulfil the need and commitment. 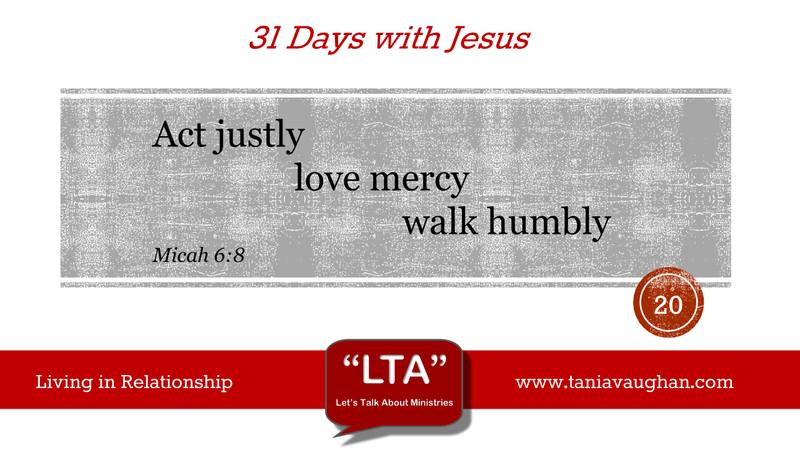 If you continue to walk on by you become like the Pharisee who did all the right things religiously but neglected love and justice (11:42). They acted only in ways that would make them look good and Jesus warns the disciples and us about doing this. The disciples returned and celebrated their acts of casting out demons, but Jesus reminds them they only need to rejoice in the fact that they are saved. Your name is written in heaven, the acts you carry out are the overflow of the love God has poured out on you, it is not the reason to celebrate. Relationships are not easy, they take time and resources. You need to put the time in to your relationship with God and he will equip and resource you with time for others. Lord, I thank you that you pour your love and mercy into our relationship. I want to celebrate that relationship and overflow with the joy of it. I don't want to be so concerned with time that I continue to walk on by. Lord, help me to show love and mercy, trusting that you will give me what I need. In my early Christian years I felt that my life had not changed from when I wasn't a Christian; I was a good moral upstanding member of society who supported truth and justice etc etc. I was troubled by the lack of change - I spoke with my Christian friends who helped me find Christ. They pointed out that they had seen a huge change in my personality; my attitude had changed but I was too close to see it. I was told I'd become kinder, I had time, real time for people, I helped others in the little things and did not mock but had mercy. Of course I could not see this but I had to rely on others to tell me. In short whilst my personality seemed to be static my witness was evolving - to be more like Christ. The further I traveled into relationship with JC the more my witness was reflecting His. Now I'm no saint - my wife will testify to that! But I strive to follow a God that wants us to know him more. One particular friend of mine at Uni helped me understand the difference between saying you are a Christian and being a Christian. The University's Christian Union was essentially Church at Uni; and like most communities the Church attracted the lonely and the needy. For several months 'Ant' had been attending and had been befriended by 'Dec'. it was clear that Ant had serious mental health issues and was ripe to be marginalized, ignored and excluded. Every session Dec would sit with Ant and help him understand the message, help him feel welcome and was able to arrange clinical support through the Uni's chaplaincy. Even when the police pitched up investigating domestic assault charges Dec was there; not to defend Ant but to walk along side him. This significant show of Christian love was more profound than any sermon on the same subject - there was not so much financial sacrifice but the sacrifice of time, energy and love was just as costly. Going the extra mile was never going to be easy.